I grew up using my mom's Sunbeam mixmaster, which belonged to her mother. It had two beaters, one of which had a plastic tip to make the bowl spin. The speed controller was a large knob on the end, with food types listed next to the speeds (remember when appliances had labels like that?). My sister and I would each get one dough covered beater. It took practice to get all the batter off the beater without getting any on your nose. Before I went to college, I recieved a new sunbeam mixmaster. Gone was the painted solid steel casing, now replaced with beige plastic. It worked fine until it was pitted against a recipe for peanut butter cookies. The thick dough proved too much for "modern" technology, and smoke soon began pouring from the motor housing. Though still usable, from then on, the mixer would stutter at lower speeds with only the highest speeds disguising the damage. When I first met my wife, she splurged on my 24th birthday and bought me my current mixer, a 75th anniversary edition KitchenAid KSM-5 5 quart mixer complete with additional bowl laser engraved with my name. I whipped up a batch of chocolate cookies and was impressed with the power of the new mixer. The first batch of cookies actually were a little off. After some experimenting I eventually ended up with my current variation of the toll-house recipe: with an extra teaspoon of vanilla and 1/4 cup of flour. The latest generation KitchenAid mixers now accommodate 6 quarts thanks to a generous sized bowl that also makes adding ingredients easier than the narrow-bowled 5 quart models. Sure, they gave you a pouring shield to help pour ingredients in, but it is such a hassle and far easier to just lower the bowl with my older model. I would strongly recommend KitchenAid mixers to anyone in the market for a new mixer. Since the introduction of the 6 quart model, many discount stores like Costco sell the older 5 quart model for around $250, which is a great deal considering they used to cost up to $400. Preparing to beat the egg yolks. Blend the eggs yolks until they are a light chiffon yellow color. 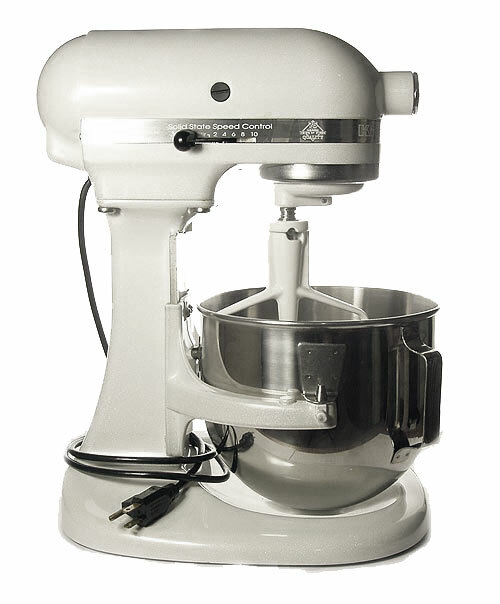 KitchenAid 100th Anniversary KSM-5 electric mixer. can I use the kitchen aid for mixing melted chocolate with corn flakes? won't it crush the corn flakes? Hi Jon, I actually avoid using the kitchenaid for mixing chips in chocolate chip cookie dough because it is pretty destructive, even with unmelted chocolate. Your best bet would be to fold the corn flakes manually with a wooden spoon (which is what I do for chocolate chips, too).